The 16ha site at Somerleyton is part of 2500ha of revegetation established for biodiversity in the Murray catchment. The saltbush was direct seeded at a cost of /ha last June after 25mm of rain the previous month. Several millimetres fell the day after sowing followed by a total of 10mm to the end of October. Mr Driver said weed control was always critical with saltbush establishment, and barley grass and secondary weeds had been sprayed. Three direct-seeding machines were used in the trial, sowing at 500g/ha on 3m-wide spacings – a scalping direct seeder (Burford unmodified), a Jenke parallelogram tyne and a Primary Sales modified tyne. “The traditional scalping machine produced some good results,” Martin said. “But the Primary Sales modified tyne gave a much more consistent strike when moisture was limiting, and that’s a big factor. “The advantages of this machine were quite pronounced in October when it was dry. “Plants sown with the other two machines were struggling.” Martin said the saltbush had transformed the paddock from bare to grazeable in nine months. By February, the average seedling density for the Primary Sales machine was 12,300/ha compared with 900/ha for the Jenke and 4800/ha for the Burford. On a dry-matter-per-hectare basis, the Primary Sales seeder recorded 1845kg. “We were flabbergasted to get a result, let alone such a good result,” he said. “I would have no qualms about grazing this site now. “We now have a crop that will last up to 100 years – it’s a great result. The 1845kgDM/ha is stored carbon above the ground, which makes the enterprise look more exciting.” Martin said the next step would be either allow volunteer grasses to grow or sow a feed (cereal) crop inter-row. “More people are looking at direct-seeding saltbush on multiple combine widths so they can winter crop in between,” he said. “The stubble can be grazed with the saltbush. “The ideal width in native grass country is 10-15m apart in 20-40ha blocks. “Otherwise 6-10m is a good spacing if there is an improved pasture base.” Martin said lucerne was not a good match for saltbush as the lucerne was preferentially grazed by stock. He said native grasses and saltbush were a “brilliant combination”. Corowa farmers Andrew and Delwyn Clifton have sown 14ha of saltbush on 6m-wide spacings. “We feed canola hay every second day and leave a gate open to a stubble paddock for the carbohydrate component,” Delwyn said. “We put the stock in when the plants were six-and- a-half months old and monitored it. “It took three days for the sheep to get a liking for it, (and) the grazing promoted growth, making the plants stronger.” Delwyn said a summer storm of 71mm had resulted in the saltbush growing rapidly. 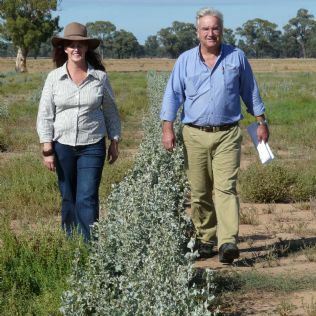 “The message is farmers don’t need a large acreage of saltbush for it to play a valuable role in farming systems,” she said. Encouraged by the success of the saltbush plantings, Martin plans to establish saltbush in the corners of cropping paddocks. Martin said saltbush needed to be grazed hard to control excess growth after summer rain. Deniliquin direct seeding contractor Stuart Sizer said seed quality was critical. He suggested landholders carry out a germination test before sowing. Stuart said fresh seed germinated within five days while seed stored for several years germinated at seven to eight days.”Using the strongest and most vigorous seed will pay off,” he said.